I haven’t been good at posting pictures recently, so here’s an attempt to make up for it. Here we have images of the polo coat that has been documented in detail over the past few months, but of which I never posted a final image, and of the ‘fishy’ suit I commissioned most recently from Graham Browne. This was my first suit with braces (so with a fish-tail back) as well as featuring a fish-mouth lapel. The fish-mouth lapel has a narrower gorge (the gap between lapel and collar), with the lapel angling upwards like a peak model but at neither the same angle nor to the same length. It is seen as a nice compromise between a notch and peak, though glancing around the various off-the-peg suits out there you will notice there are many variations on the notch, both in size and angle. There are essentially two variables – the angle of the seam between lapel and collar, and the size of the gorge. If the seam is more horizontal, the lapel is flatter and sticks out more, achieving some of the broadening effects of a peak. 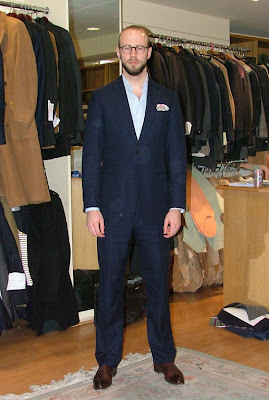 Many modern suits give the impression of a higher gorge simply by changing the angle of the seam. If the size of the gorge is bigger, both collar and lapel are pushed apart. This dates a suit from the 1980s as much as the height of the gorge. Of course, the notch lapel is defined by the angle of the seam continuing in a straight line along the lapel. A peak and fish-mouth lapel both angle upwards, to a greater or lesser extent. 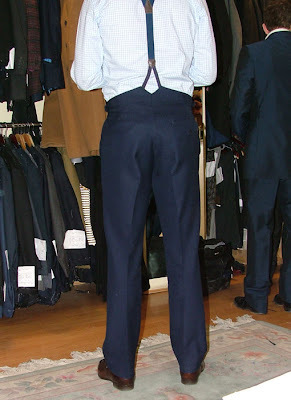 I like the braces – the trousers certainly hang better at the front and the waist is larger and more comfortable. However, I’m not sure I’ll ever get used to having something around my shoulders. The next commission (Minnis mid-grey flannel with patch pockets) will switch back to normal trousers. And this may even be altered to that style eventually. I couldn’t be happier with the polo coat, though I am reconsidering the choice not to have turn-back cuffs. The style probably suits it better, but the camelhair is so heavy that I feel tired just at the thought of it. 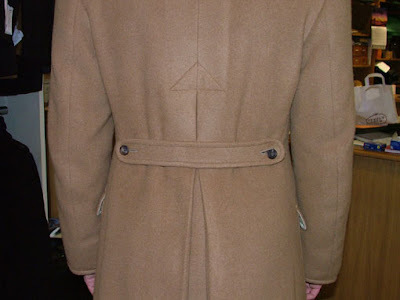 The back of the coat, which featured so heavily in the pieces on its design and construction, is shown here in two different settings – mid and tight. As I am wearing a suit and cardigan underneath, the tight setting (close-up shot) is a little too tight for easy movement here. It would be used if I were just wearing a sweater. You can follow the discussion on Fishy and polo: A photo update by entering your email address in the box below. You will then receive an email every time a new comment is added. These will also contain a link to a page where you can stop the alerts, and remove all of your related data from the site. Nice to see the coat finally completed, and it looks great. I was a bit unsure about the whole concept (although I totally agree with the requirement for a coat that can fit over a number of different types of clothing) but I think it’s turned out really well, and the action back looks great as well as being practical. Do you mind sharing what fabric that suit is? It’s a beautiful blue. Also, I think we might have the same tastes in suits. My next suit is also going to be a Minnis mid grey flannel with patch pockets. Been looking forward to having that made for quite some time. I look forward to hearing about your experience in doing the same. That’s a lovely coat – I’m inclined to have something like that made up in navy with a velvet collar and set-in pockets, almost a cross between a Chesterfield and a Polo coat. How come your wearing brown shoes and not black ones? I thought it was “no brown in town” especially in London? Pity you’re not wearing a tie. OPEN-NECKED SHIRTS SIMPLY DON’T GO WITH SUITS! The suit and coat are great, but why spoil the whole look by going tieless? Its so far off the neck (the overcoat), needs help. I like wearing the collar up on cold days and don’t consider it sacriligious. However, a peaked lapel like this doesn’t function that well in that capacity and cannot be buttoned. You’d want a notch lapel with perhaps a closed gorge between it and the collar. May I enquire how much Graham Browne charged for the coat? Of course – in camel hair, £1400. Much cheaper in a wool, camel hair is almost as expensive as cashmere. The wool tweed one I had made this year was £900. Interesting, that’s less than I thought. Many thanks, they both look terrific and thanks for arranging the Pre-New Year discount. I certainly took advantage of it. Very pleased to hear it, I hope you enjoy your commission immensely. Hi, Would it be possible to have a closer look at the fishmouth lapel made by Graham Browne ? thanks ! 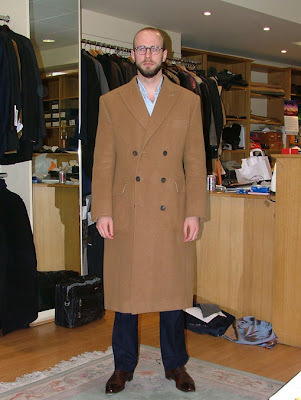 I’m looking to assess UK tailor’s ability to replicate a fish mouth lapel, camps de luca/arnys’ style..
Know you’ve mentioned elsewhere that the polo coat proved to be impractical partly because it wore so warm- is this on account of the weight of the material you chose or the camel hair itself? 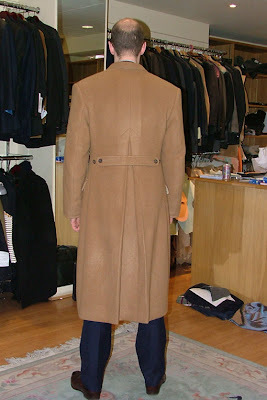 Would you advise away from camel hair entirely for coats or just to choose lighter weights (20oz? )?I’m considering a polo- style coat commison and have been weighing up whether to go for a classic camel hair or otherwise a camel- coloured cashmere. Thanks for any help! Would you ever consider commissioning another polo coat? What would you do differently now, and what tailor do you think you would use?